I awoke to the familiar sound of dishes rattling in Mother’s kitchen and to the thick scent of coffee wafting through the air. I glanced out my bedroom window; the neighborhood was lit by the first rays of the day shining through a thin layer of gray clouds. The trees, no longer their virescent hues of spring and summer, were scarlet, gold, and copper. Mesmerized, I watched the leaves fall off the trees gently swaying in the November wind. A sigh rose in my throat as I thought about what was lacking that Thanksgiving Day. I joined Mother in the kitchen, mildly curious about the Thanksgiving brunch she’d planned for us at an undeveloped park outside of town. Instead of cooking the usual Thanksgiving fare, Mother prepared a thermos of hot cocoa for my brothers and me and another thermos of coffee for her and Father. 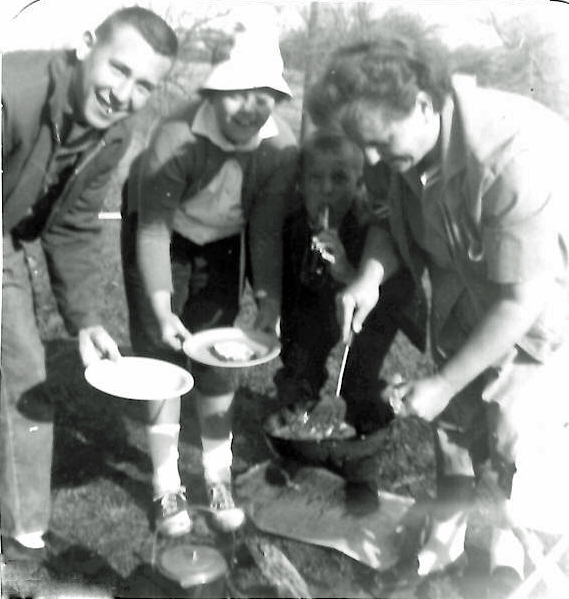 I smiled, covering up my disappointment, and helped Mother pack a box with the utensils she’d need; a cast iron skillet, tin plates, charcoal briquettes, matches, a spatula, and two wooden spoons. Father loaded the box into his truck while my brothers and I clambered into the truck bed. He pumped the gas pedal several times until his cranky jalopy sputtered into action. On the way to the park, Father pulled into the parking lot of a local grocery store; through the rear windshield, I watched my parents cull through their pockets, the seat cushions, and the glove box gathering all the loose change they could find. “This should be enough,” Mother said in a thrilled voice. She scurried out of the truck and emerged minutes later, smiling with two dozen eggs, a pound of bacon, and a small loaf of bread in her arms. Once at the park, my brothers and I bolted from the truck, frolicking in the leaves as we ran along a pathway that led to an old abandoned farmhouse. While they explored the farmhouse, I sat on a log; closed my eyes; and took in all the crisp autumn air my lungs could hold slowly expelling it. In the distance, I heard Father whistling and Mother singing as they fried bacon and eggs over a crackling fire, seemingly oblivious to the fact that our grim financial situation prevented us from celebrating Thanksgiving as we always had with turkey, dressing, and all the trimmings. “Come and get it,” Mother hollered. We dashed toward them and sat on the ground, warming our hands on the open fire. Mother scooped fried eggs and bacon onto our tin plates. “Let us give thanks, for we have enough,” Father said, his face beaming. “Enough? 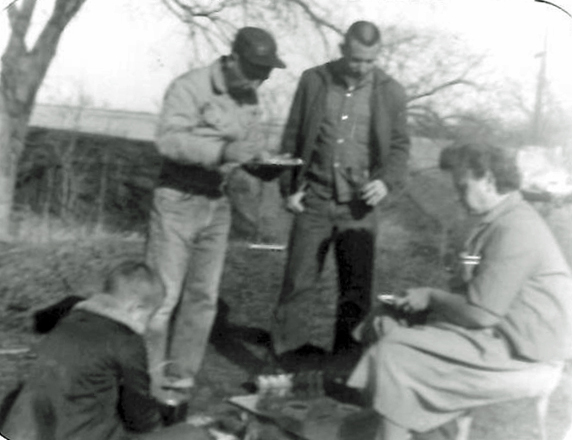 !” I looked down at the meager amount of food on our plates, my eyes misting with tears. What a blessing hearing that word was, for acknowledging enough squelched my expectations; diminished my disappointment; and helped me realize that enough is at the core of gratitude and Thanksgiving. 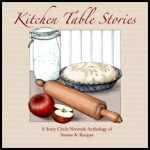 This entry was posted in Sara Etgen-Baker and tagged Celebration, Cooking, Gratitude, Thanksgiving, Women's Stories. Bookmark the permalink. Thanks for this story who shows how one can turn scarcity into plentiful. even though my family was poor, it truly focused on abundance not our scarcity. As a result, we were abundantly happy. I’m grateful for my parent’s character and inspiration. There is more than one way to have a meal and give thanks. I agree, Patricia. Thanks for reading and commenting. Reminds me of a sig line my sister used to use: Enough is a feast. Thanks, Betty, for reading the piece and commenting. Happy Thanksgiving! You are blessed to have a father you knew you had ENOUGH. What a great lesson imprinted on your young mind. Happy Thanksgiving! Thanks, Marian! You’re right…my father was a special man with an equally special heart and spirit.